The LAB-X2 contains the circuitry required by the PICmicro MCU to operate: 5-volt power supply, oscillator, reset circuit, as well as an RS-232 serial port and basic analog and digital I/O. Both 40 and 28-pin DIP microcontrollers are accommodated. All of the pins on the MCU are wired to a 40 pin connector which can be used to connect your prototype circuitry. The LAB-X2 can run programs written in assembler, C and PicBasic or PicBasic Pro. 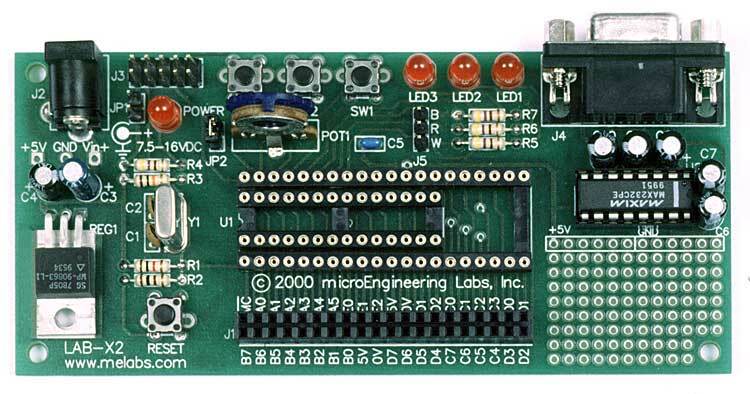 The in-circuit programming connector allows the resident PICmicro MCU to be reprogrammed on the fly (requires flash device) using programmers that support this feature like our melabs U2 Programmer. It is recommended the LAB-X2 be used with the 40-pin PIC16F877 or the 28-pin PIC16F876 (available separately). These flash devices may be reprogrammed again and again. Since you build your project on a separate protoboard, you can use the LAB-X2 for concurrent development of several projects without the hassle of disassembly or the expense of multiple development boards. Just reprogram the X2 and move it to the next project.